Simon Gerrans (Orica GreenEdge) clocked up his second win of the year when he powered to victory on stage six of the Volta a Catalunya, galloping into Valls ahead of Gianni Meersman (Omega Pharma Quick Step) and Samuel Dumoulin (Ag2r La Mondiale). The Australian rider was several lengths back with 100 metres to go but put in an impressive surge to overhaul Meersman, who looked set to nab his third stage victory of the race. The trio were part of a group of approximately fifty riders which disputed the stage result, with the day’s final climb of Alt de Lilla splintering the peloton and causing that selection. The group roared down the descent and mopped up a breakaway of eight riders which had earlier pushed ahead on the first category Alt de Prades. Garmin-Sharp rider Dan Martin had a successful day in the leader’s jersey, adding to his overall advantage early on when he picked up three seconds in a bonus sprint ahead of two of his team-mates. His main rivals didn’t succeed in gaining any gaps on him on the day’s two big climbs, and he finished safely in the main bunch. He is now seventeen seconds clear of Joaquim Rodriguez (Katusha), 45 seconds ahead of Nairo Quintana (Movistar) and 54 up on Bradley Wiggins (Sky). With just one stage remaining he will be feeling confident, although Rodriguez is certain to try to get the time back on tomorrow’s concluding eight circuits of the Montjuic climb in Barcelona. Today’s 178.7 kilometre stage featured the first category ascent of the Alt de Prades (km 112.3) and, later, the second category climb of the Alt de Lilla (km 164.2) and thus offered challengers to Martin’s leader’s jersey two opportunities to try to gain back time. The early part of the stage played out at a very rapid pace and no breakaways were able to stay clear. After thirty kilometres of racing there was an intermediate sprint at Alcarrás and there Martin hit the line first. The outcome was the best possible for him, as his Garmin-Sharp team-mates Koldo Fernandez and Ryder Hesjedal took second and third, ensuring that Martin pocketed a three second time bonus over his rivals. After 62 kilometres of racing the peloton split into two halves under the speed, but soon came back together. The riders continued on to the 100 Editions of the Tour de France sprint at l’Espluga de Francoli, 94 kilometres after the start, where Mads Christensen (Team Saxo Tinkoff) edged out Jean Paiani (Sojasun) and Andrew Fenn (Omega Pharma Quick Step). The category one climb of the Alt de Prades began very soon after that sprint and attacks started firing off. An eight man group was established there, with Egor Silin (Astana), Mikel Astarloza (Euskaltel), Alberto Losada (Katusha), Simone Stortoni (Lampre), Jose Herrada (Movistar), Joshua Edmondson (Sky), Chris Anker Sorensen (Team Saxo Tinkoff) and Daniel Navarro (Cofidis) securing a gap over the peloton. The octet continued to gain time as they neared the summit, where Herrada led Astarloza, Losada and the other five across the prime line one minute and eight seconds up on the bunch. Silin and Navarro had started the day two minutes 39 seconds and two minutes 42 seconds back respectively, and were consequently threats for Martin’s jersey. As a result the chasers behind kept tabs on the group, witih the advantage only going out to a minute and a half before the pendulum swung back again. With twenty kilometres to go to the summit of the second category Alt de Lilla, the break was just forty seconds clear. Navarro knew that the escape was likely to be brought back and tried to push on alone on the climb, but he was hauled back. Losada surged closer to the summit and crossed the prime first, but he was reeled in by the others. Meanwhile in the peloton, the challenge to Martin’s jersey didn’t materialise, although the pace on the climb caused gaps in the peloton which would widen on the descent. FDJ rider Thibaut Pinot attacked on the downhill and dragged a group clear, but that move was short lived. Wiggins was near the front and seemed ready to take any opportunities should Martin let a gap open. However the large group stayed together on the downhill and beyond, bringing an end to that threat. The BMC Racing Team took over at the front to try to haul the breakaway back and ensured the move was well within eyesight inside the final ten kilometres. The junction was finally made with about five kilometres left, with Astarloza jumping at the moment of contact in a futile effort to hold clear, but being reeled in right away. From there the sprinters’ teams worked hard to control things, ensuring the group raced into Valls together and settled things in a big gallop to the line. 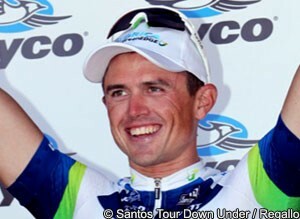 Gerrans was very focussed on landing a result after an unsuccessful defence of his Milan Sanremo title and played things perfectly. “In the build-up to the sprint, I positioned myself around the guys that I know are going quite well at the moment,” he explained. His characteristics mean that he could in theory be a contender on tomorrow’s final stage, but his chances of back to back victories on successive days depend on how things play out with the general classification contenders. Rodriguez favours climbs such as the Montjuic ascent that will feature tomorrow, and has eight ascents to try to get a gap on Martin. The Irishman is clearly going well, however, and is also good on steep ramps. Quintana and Wiggins are further back and have a more difficult task, but could well have a go. Should Martin be able to hold on, the result would be the biggest stage race success of his career. He won the Tour of Poland in 2010, but while that is also a WorldTour race, the history of the Volta a Catalunya plus the strong lineup taking part means that it would be a more prestigious triumph.